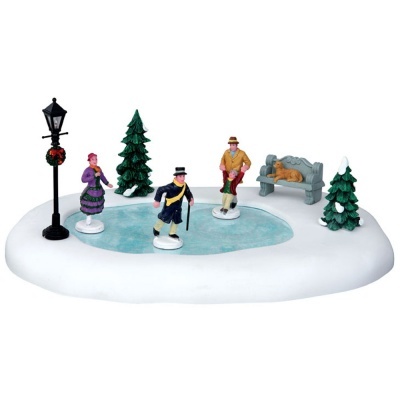 Lemax Skating In The Park Table Accent (Set of 8) depicts a joyful Victorian family enjoying a seasonal skate on the park pond which has iced over in Winter time. A delightful battery operated miniature Lemax table piece to compliment your miniature Winter village display. The 8-piece scene includes 3 Victorian figurines that realistically skate in sequence on the iced pond which exists on a snowed platform. Set includes accessories of 2 Christmas trees, 1 park bench and a traditional Victorian lamp post which can be placed around the iced pond. Scaled and themed for placement in and amongst your Lemax Village scene to add movement in a Winter setting. Battery operated as standard, powered by an internal battery compartment underneath (AC mains adaptable). Skating In The Park is a recent addition to the range, joining the Lemax Caddington Village collection in 2014.